With the cedar waxwings overhead and the light failing, I turned to look behind me at the creek–diminished as it is with our relative drought that is so far nothing like as serious as the one of 2002 which left us minnow-less. This is the wide and shallow area where Abby did her serious crawdad-hunting back last summer, and it is full of tiny fish in a frenzy as I step closer for a better look. But the best look for photo-purposes wasn’t good enough for very good image: with the glare of the water, the low light, and these honey-I-shrunk the trout minnows zooming this way and that, this was the best I could come up with. But maybe you can see enough, fish experts, to offer an identification. 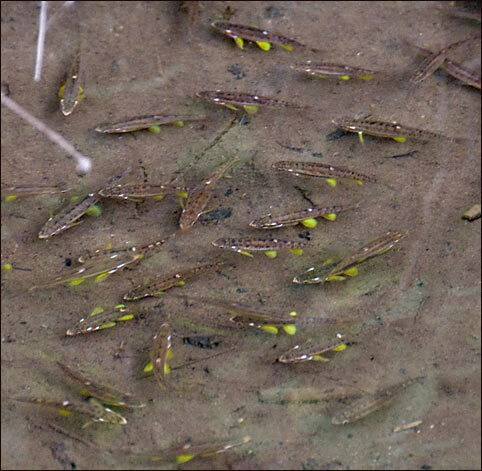 I’ve seen Mountain Red Bellied Dace here before, and am operating on the assumption that these might be the females with the distinctive lemon-yellow fins. If so, as long as I watched, I did not see a male with the conspicuous red and black streaks. So if you have a fish-ologist contact, please forward this link and image so that, when I go back with the tripod and better lighting (and a polarizing filter would be nice!) I’ll know by name who I have the pleasure to be photographing!